Carol Anderson talks about her bestselling book White Rage: The Unspoken Truth of Our Racial Divide. Anderson says every time African Americans make gains — from ending slavery to voting rights to the election of a Black POTUS — white Americans mobilize relentlessly to roll back those gains. She says the correct question is not why Black people are angry; it’s why whites are so angry when Black people get rights? What happens to a dream deferred?/ Does it dry up/ Like a raisin in the sun?/ Or fester like a sore–/And then run?/ Does it stink like rotten meat?/ Or crust and sugar over–/ like a syrupy sweet?/ Maybe it just sags/ like a heavy load./ Or does it explode? But read the first line again — “what happens to a dream deferred” and ask yourself: why have the dreams of black people in American been systematically deferred? Why are black people still having to assert that “black lives matter”? Why do we have a President whose one overriding policy goal is to undo everything our first black President accomplished before him? The answer is in Carol Anderson’s groundbreaking book, White Rage: The Unspoken Truth of Our Racial Divide. She proves again and again what should be obvious but what our society always seems to overlook: since 1865 and the passage of the Thirteenth Amendment, every time African Americans have made advances towards full participation in our democracy, white reaction has fueled a relentless rollback of their gains. Anderson’s book is a powerful indictment of white racism, especially as it has been expressed in our institutions from the courts to the press. It also is freighted with grief at the terrible waste of lives and possibility that racism has cost not just our black citizens but our society as a whole. 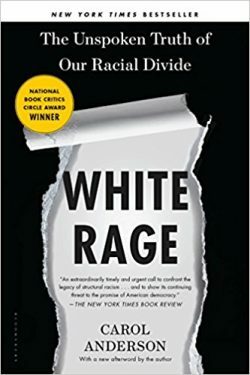 White Rage should be required reading in every high school and for every politician — indeed, every public servant. Many must agree, as the book has won numerous accolades. Carol Anderson is professor of African American Studies at Emory University. In addition to White Rage, which won the National Book Critics Circle Award, she is the author of Eyes Off the Prize and Bourgeois Radicals. It was an outstanding and revelatory interview. Lively interaction, very positive.